150px-Michigan_J_Frog, originally uploaded by Victoria Sobocki. 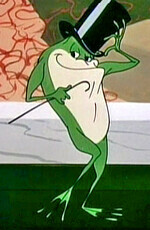 Michigan J. Frog is discovered by a construction worker demolishing a 50+ year-old building. The frog pops out of his box and starts singing. The worker imagines making tons of money off such a discovery and goes about various methods of getting the frog to sing on stage. The only trick is, Michigan doesn’t sing for the crowds. He only sings at the most inopportune times for this lone entrepreneurial-minded construction worker. The worker loses everything and ends up putting the frog back in a box, in another cornerstone… only to be rediscovered 100 year later by another worker. In a seemingly random act of sub-consciousness, I had a dream that carried elements of this frog-based story. The frog still sang – which in and of itself is an extraordinary act – but he sang before a small audience of 8 or so, on a stairway landing between to floors. A great performance. You really should have been there. How often do childhood cartoon experiences seep into adult subconscious messages? As I consider the context of said dream, I imagine that for my life the singing frog was representative of Gifting. We all have something that may not make sense but is extraordinary in its fullness, written into us. For my part, it takes a lifetime to learn not only what the gifts are but where they have their best place to shine. I am still learning. In the dream, the singing frog seems to be some gift that’s been around since childhood. Not only so, but it thrives, awakens and sings or rises to the occasion in Liminal space – a threshold between two planes – or in this context a landing on a stairway between two floors… and strangely looks like a cartoon frog named Michigan. This got me thinking back to the original cartoon. Whether or not Chuck Jones had it in mind, I know not, but what if it is a warning against the exploitation of our gifting? A seemingly vague man discovers something extraordinary while in the midst of mundane work. The “something” is not meant for massive audiences and simply as a means of increasing financial wealth. In fact, it initially is meant for his delight alone. Maybe a few others, as time goes by, but not until the man learns to enjoy it first. But if it is taken too far too fast, the gift will only frustrate, disappoint and possibly bankrupt the individual. This might be too much to ask of a children’s cartoon, but are not children’s stories often sculpted out of the mythical? Aesop’s fables, Harry Potter, Tolkien’s “Lord Of the Rings” – they all carry the eternal myths that resonate with the deepest Story we forgot along the way. And for my part, it might be that for me to “hear” where my part is in the Story, it had to come through a cartoon frog in the middle of the night amidst sleep and liminal space. It would seem that kids watching cartoons is not such a bad thing after all. He or she might just discover a reflection of their gifting, to be reveled decades later like some secret time capsule or like a frog in a cornerstone amidst the reconstructions of a life.